Information below can also be found on the Animal Advocates WatchDog. The Watchdog has been discontinued, but not AAS. Visit their Facebook page. Over the past three weeks, rabbits have cost Richmond farmer Bill Zylmans nearly $30,000. "Maybe in a yard it's a cute bunny, but this is my livelihood here," Zylmans, 48, said yesterday. Zylmans, whose family has farmed in Richmond for 57 years, has never before had a problem with rabbits. He first noticed damage to his three-hectare pumpkin patch near Gilbert and Finn roads several days after seeding on May 10. "I come out and go, 'What are all these holes? What's this about? There's friggin' bunnies here,'" he said. He bought more seeds and has twice paid a team of seven to re-seed the patch. But he can't stop the rabbits from feeding on the seeds. "In the morning, you see 200 or 300 of them out here," he said. On Monday, Richmond council recognized the problem that farmers south of Steveston Highway are having. "There's a very large rabbit population that has gotten out of hand," said Coun. Evelina Halsey-Brandt. "We've asked staff to look at what is the most humane way of getting rid of the rabbits, whether it's getting a permit to dispose of them using pellet guns or whether it's trapping or whatever." There is a longtime rabbit population at the Richmond Nature Park north of Westminster Highway, but that's more than eight kilometres from Zylmans' pumpkin patch, which is among more than 202 hectares of farmland south of Steveston Highway. Halsey-Brandt blamed negligent owners abandoning their pets. Rabbits have a lifespan of eight to 12 years. Females give birth to up to 30 young a year. "Do you get a handle on it now and deal with the situation, or do you let it multiply as much as the rabbits are?" Halsey-Brandt said. "I'm doing everything I can not to laugh. It is serious, but it's kind of funny at the same time." (Caption to newspaper photo) Richmond farmer Bill Zylmans says hungry rabbits are running roughshod over his vegetable crops, destroying seedling on a three-hectare pumpkin field -- a problem that Richmond council is now attempting to address. In Victoria, there is also a huge rabbit overpopulation problem which results in tremendous suffering every year. Talking with various pet stores that sell baby bunnies has resulted in the same non-interested reply, "We have contracts with local breeders and must buy from them and see nothing wrong with the size of the cages we sell." I think it is unconscionable in this day and age that the Society that is supposed to speak out against cruelty to animals still keeps rabbits in tiny cages and does what appears to be nothing to educate pet stores and consumers about rabbits. Eradication of hundreds or thousands of living breathing creatures is a terribly sad and unacceptable solution to a human created problem, especially when nothing is being done at the source of the problem. The Sharing Farm at South Dyke, which grows vegetables for the Richmond Food Bank, has also been hit hard this spring by hairy critters. The Sharing Farm’s Mary Gazetas said crop damage due to rabbits is much worse this year than last. Gazetas said volunteer farmers have tried several methods of stemming the problem. Last year they tried inflatable snakes and owls and this year they laid a cloth over the seeds and plants—but the rabbits are eating through it. “It’s reached a point where you just have to do something about it or we’ll lose everything,” she said. Coun. Harold Steves called on the city this week to do something about it. “The population has gotten bigger and bigger and bigger and now it’s damaging crops.” Steves said the city’s role in controlling wild animals has been limited to trapping and relocating beavers, which were building dams across drainage canals and flooding fields in East Richmond. According to one farmer, city staff are also going to be trapping and relocating the rabbits. Most rabbits have an average lifespan of seven to 12 years. Females have the ability to reproduce every month, yielding litters as large as 10. Richmond Society for the Prevention of Cruelty for Animals Richmond branch manager Kim Marosevich said there’s a large population of wild rabbits indigenous to the Lower Mainland that are a problem for farmers. But the real issue, she said, is the release of pet rabbits into the wild. Marosevich said people have come to the SPCA shelter having witnessed a rabbit being set free, as some pet owners—seeing other rabbits running free—dump their pets in Richmond after discovering the effort and cost in keeping them. In order for the SPCA to take any enforcement action against those owners, they must be caught in the act and the SPCA must find a sympathetic judge. “That tends not to be the biggest fish that everybody has to fry in the justice system, so it is difficult,” said Marosevich. Life expectancy in the wild is dismal, as most pet rabbits become food for coyotes, raccoons, owls and hawks. But some survive long enough to have babies. Therein lies the problem, said Marosevich. While owners of dogs and cats are getting more and more accustomed to spaying and neutering their pets, rabbits don’t get the same treatment. Rabbit welfare groups and the SPCA have argued pet stores that sell rabbits should spay and neuter them—or not sell them at all. The Richmond shelter has 25 rabbits. The SPCA keeps its adoption fee low, $50, which covers the cost of spaying or neutering. Although sympathetic to the farmers’ plight, Marosevich said a cull of the rabbit population in Richmond is only a short-term solution. She said the city could set a precedent for other municipalities in enacting a bylaw around the sale of rabbits. The proliferation of abandoned pet rabbits is an ever-increasing one and municipalities all over BC, and beyond, have problems similar to the ones in Richmond. Once a colony is established, it's next to impossible to eradicate. As the principal animal welfare agency in BC the SPCA could lead by example and sterilize all its animals prior to adoption. Adult rabbits are very difficult to find homes for, and the surplus is far in excess of the demand so that's presumably one of the reasons that the Surrey SPCA, for example, has unaltered rabbits available for $20.00. Then, too, in all likelihood, more than a few of them are put down. Rabbits do not make good "pets" as numerous people find out after making an impulse purchase of a cute little baby. In my many years of rabbit rescue and advocacy I've received hundreds of calls asking me if I could take a no-longer wanted rabbit. I'm often told that the rabbit was purchased at Petcetera, the largest retail pet store chain across Canada. Yet the BC SPCA continues to partner with this retailer, a deal made back in the late 90's. It's unthinkable that an organization which exists to prevent animal cruelty associates with a company whose business practices perpetuate both inhumane attitudes and the keeping of a variety of caged animals. Rabbits are generally considered a "starter" pet for a child, kept in a cage, often neglected, and then abandoned in one way or another after becoming inconvenient. I've written to the BC SPCA many times regarding my concerns about rabbit welfare but so far little, if anything, has changed. It was only last month that the Vancouver branch finally removed its lab cages. In the current spring issue of the kids magazine, while mentioning that a rabbit cannot live in a cage without exercise time, it then states as a minimum, two hours of hopping about outside of the cage. Can this really be considered animal welfare, let alone leadership of any type? The issues and the plight of rabbits as companion animals are many, as are the opinions on what to do. Meanwhile, as we discuss and ponder, the rabbits remain the victims. “As long as we have people contributing to the feral and the domestic population in Richmond, it’s going to be a chronic problem in Richmond" said the Richmond SPCA's Kim Marosevich . Two of the biggest sellers of sexually intact rabbits in BC are the BC SPCA and its business partner, Petcetera. Abandoned sterilized rabbits cannot become a problem. It is selling sexually intact rabbits that has caused this problem, not abandonment. Abandonment is another problem, and it stretches credulity to believe the SPCA is not aware of the distinction. The SPCA's partnership with the animal-selling Petcetera can't be animal welfare as the SPCA would have the public believe, because it cannot be animal welfare to keep any animal in a cage and Petceteras have hundreds of caged animals for sale every day. Animals in cages is part of the pet trade which also sells the cages. In fact, the animals are often no more than loss-leaders with the real money made in the accessories. An animal in a cage is not a pet - it's a prisoner. It is cruel to the animal to keep it caged, no matter how nice the cage is (and the SPCA's and Petcetera's little sales cages are not large enough to be called "nice" even if there were such a thing as a "nice" cage). Petcetera gives free retail space in its stores to the SPCA and in exchange the SPCA allows Petcetera to link the two names. Marketing doesn't get more powerful than that. The marketing message is it can't it be wrong to keep animals in cages because the premier animal welfare organization in BC clearly approves. In a series of articles in 1997 and 1998, the Vancouver Sun's Nicholas Read told how the SPCA cut a million-dollar deal with Petcetera. After this the partnership got closer, with Petcetera's and the SPCA's names on the SPCA's Petcetera-financed transport vans. “As long as we have people contributing to the feral and the domestic population in Richmond, it’s going to be a chronic problem in Richmond" said the Richmond SPCA's Kim Marosevich. The SPCA has been blaming "irresponsible people" since the year dot, and it works like a hot damn. The Richmond papers will get many letters from weepy people who will write that the SPCA is doing its best and it's all the fault of all those "irresponsible people". Sometimes stories like this even make money for the SPCA, as generous animal-lovers make donations to help the SPCA with an awful problem. Hundreds of times, all over BC, over and over in the media, for fifty years at least, the SPCA has blamed "irresponsible people" for all the killing it does and for all the unwanted pets. Incredibly, it gets away with this even while it sells intact animals and even while its own staff bred and sold animal on the side. If it is irresponsible to not sterilize your pets, then the SPCA is the most irresponsible of all. And it intends to keep selling intact animals until 2010. The $30,000 in damage caused by rabbits to the crops of Richmond pumpkin farmer Bill Zylmans is a direct consequence of irresponsible pet owners releasing these rabbits to fend for themselves. Not only is it cruel, but it causes big problems for the area. It would certainly go a long way towards relieving the burden placed upon rescue organizations and the B.C. SPCA, which are expected to deal with the consequences. Only now that abandoned rabbits have been recognized as a financial liability as well as a nuisance is Richmond city council considering some sort of action, albeit misguided. The abandonment of domestic rabbits has been soaring for years. Concerns over unregulated breeding and selling, mainly through pet stores, have been raised by animal-rescue advocates to pet store owners, the B.C. SPCA and local governments on numerous occasions. Nobody has chosen to act to stop this madness, and it was the rabbits that suffered. Now pellet guns are being considered as a control method. Come on, have a heart. This would be as inhumane as it is thoughtless and pointless. The Richmond rabbit epidemic is no surprise. We knew there was a problem back in 2004 when a colony of rabbits took over a schoolyard. But, when we tried contacting the city, we met with a closed door. Now that an "innocent bystander" has lost a lot of money, perhaps finally someone will listen and take responsibility. We need an education centre and a place for people to surrender their unwanted rabbits. We receive calls that, if we do not take the rabbit, they will take it to the "bunny park." This is extremely frustrating. If we don't control this problem in Richmond and other cities, it will only get worse. The cities need to work with those who know about this species. We have solutions, but we need government and the public's support. Small Animal Rescue Society of B.C. Rabbit rescuer Leona Schwalback wrote, "We need an education centre and a place for people to surrender their unwanted rabbits." This attitude actually perpetuates and entrenches the problem. Ms Schwalback's solution is to make it easier for more people to abandon rabbits so it follows that more people will buy rabbits. Ms Schwalback keeps rabbits in her garage, others keep them stacked in apartments and basements and barns. Not many animals are served by the "bigger shelters" model of animal welfare, as the supply of used pets is much larger than the demand, in the case of rabbits, perhaps a thousand to one. It is the "shelterer" who is served. It's possible to make very decent money in the sheltering business if your business is big enough, and the center Ms Schwalback proposes would be that. But for the majority of animal rescuers and shelterers, their need to be actively ministering to helpless creatures is the motivation. On the face of it, that seems beyond criticism. But in fact it serves self-interest as much as the big business shelters do. There is a lot of glory in being a ministering angel, especially if you are on TV or in the press cuddling helpless little animals. Self-interest drives much of what passes for animal sheltering. There's money and there's glory, and if you are smart enough (and you don't have to be very smart as the public and the media are so easily fooled), there is both. But don't call it animal welfare if you promote more sales and more shelters or condone keeping animals in cages. Rabbit rescuers must sometimes look into the eyes of the rabbits they are stuffing into cages. Do they not see how wrong it is to promote this by saying that rabbits make good pets for apartment dwellers and people who work full time? Rabbit rescuers know that most rabbits live in tiny cages until they die or are abandoned. They know that rabbits are timid prey-animals and do not like to be handled and are not very responsive to humans. And yet they keep promoting rabbits as pets. How is that any different than the SPCA and pet stores? There is a lot of self-serving cant about education by the SPCA, Petcetera, and most rabbit rescuers. But their education teaches that it acceptable to keep an animal in a cage as long as you keep the cage clean, let the rabbit out a bit and spay or neuter it. In other words, the education is actually part of the promotion. An animal in a cage is not a pet - it's a prisoner, and shame on anyone who promotes this. Advocacy against keeping any animal in a cage is true compassion and true animal welfare. The unregulated breeding, promotion, and selling of intact, cute baby rabbits, mostly through retail pet stores, such as Petcetera, is the main contributing factor in the abandonment of these "pets." 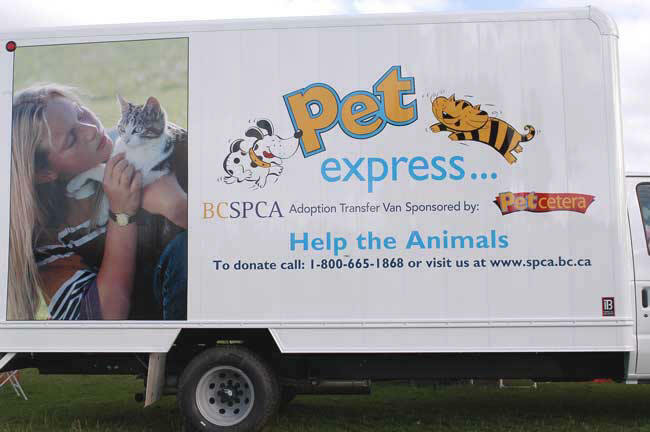 So why does the BC SPCA, an animal welfare organization which exists to prevent cruelty, partner with a company whose business practices perpetuate both inhumane attitudes and the keeping of a variety of caged animals? Rabbits can reproduce about every thirty days, and the SPCA refers to them as the "multiplying champion" so one would think that they wouldn't be "adopted" intact. Not so; as of Sunday there were several very obviously unaltered males available at the Surrey branch. Because of the huge surplus, and the fact that adult rabbits have proven over the years not to be in demand, many have also been killed. And until last month the Vancouver SPCA was using lab cages to hold rabbits as well. This is most definitely not animal welfare or leadership. Discarded domestic rabbits can be found everywhere and rescue/advocacy groups handle more of them than all of the Lower Mainland SPCA branches combined. More often though than not, and without a second thought, they are simply dumped outdoors after becoming inconvenient or costly, a dismal commentary about human society. Richmond SPCA manager, Kim Marosevich, said that the cause of the rabbit problem is irresponsible people. The SPCA has been blaming "irresponsible people" for a long time. But how do you square the BC SPCA's business partnership with Petcetera, which sells sexually intact rabbits, with that statement? And right next door to Richmond (where rabbit rescuers are largely responsible for stopping the sales of intact rabbits by the Richmond SPCA), the Surrey SPCA is still selling them. Abandonment is not the problem. Promoting rabbits as pets and selling intact rabbits is the problem, both of which the SPCA does. March 2013 BC SPCA launches new animal abuse hotline Anyone with information about a suspected case of animal cruelty is asked to call the new BC SPCA hotline at 1-855-622-7722 (1-855-6BC-SPCA). If it’s outside of office hours or an emergency call your local police department or the RCMP. BE PERSISTENT. The animals need your help!